How about a buko a day? Will it also keep the doctor away? ~ Live. Share. Inspire. How about a buko a day? Will it also keep the doctor away? I turned off my desk's computer and started to pack my things. It's 8:30am and I am ready to go home. I am happy to leave the office earlier than usual and wrap up the first day of work for the week, satisfied with my performance. Char! I am chirping like a bird as I walk towards the elevator. I need to pass through the sidewalks of Landmark to reach the jeepney waiting area. The streets are already busy with people from different walks of life and a LOT of vehicles. I lined up in a quite long queue of passengers - I think I am in the 15th. The barker started to collect 7php. I was smiling then he stopped in front of me and announced that the next batch need to wait for the next jeep. Whooaa?? Just my luck! My smile turned into a pout and I patiently waited for the next one. As usual, traffic is heavy during this time of the day - majority is in a hurry to go to work and some are eager to go home. It has been 30mins since the jeep departed from the area. I am literally stuck in the traffic and I can hear co-passengers complain. Other passengers whose offices are within walking distance from where we are, opted to go down and hike. I started to feel iritated and restless with heat, pollution and honking of horns. Other passengers are just sleeping in their seats. The sun's heat is getting intense even if it is still 9am. I need to stay hydrated with an entire buko! 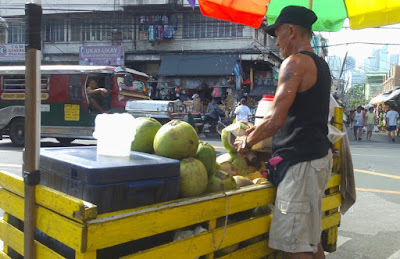 Manong skillfully whipped his bolo to open the buko (young coconut) and poured the water in a plastic bag. With a flexible knife (not sure if it is just improvised), he scraped the tender buko flesh and placed it in the plastic to join the water. In my head, I can imagine myself clapping like a child. It is fat and Cholesterol free! Aids in weight loss and helps achieve hydrated, glowing skin! Boosts metabolism and aids in easy digestion. The buko meat is also a good source of vitamin A, E and known to help reduce level of bad cholesterol. I am a rice-lover and I would tend to have more than 1 serving in a meal. With the buko meat, I am able to reduce rice intake and have it as a substitute. I am so proud of that! What are you waiting for? Visit the nearest buko cart in your location and grab one or two now! Stay hydrated! Back to my routine -- I decided to take tricycle to reach my place for 16php. In some days when the weather is not so hot, I also opt to walk through the wet market. I arrived with a smile and sparkling eyes, ready to take my lunch and some beauty rest. Lesson for today: whenever you are in a not-so-good situation, think of positive thoughts. Just smile and you will surely survive the day!